The specter of Who's Afraid of Virginia Woolf looms large over Oren Moverman's The Dinner, based on a twice-adapted novel from Herman Koch. 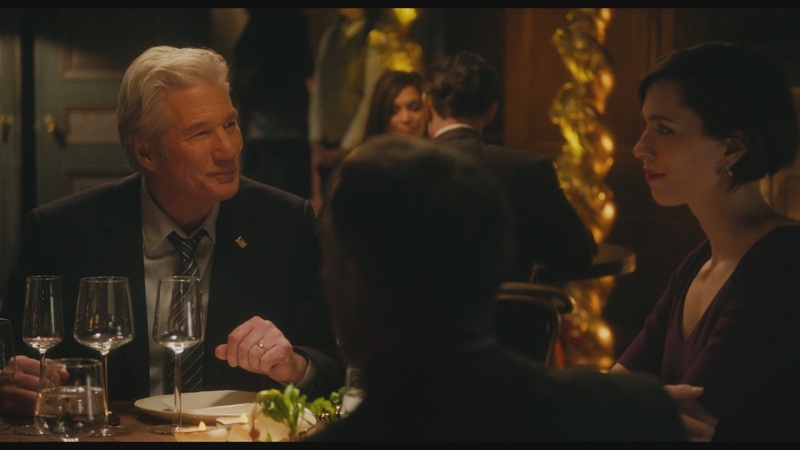 Starring Richard Gere, Laura Linney, Steve Coogan, and Rebecca Hall, this modern morality play offers delicious bites of the dark side of suburbia, as well as the seedy underbelly of middle-class life, but it may be a little over-stuffed for its own good. And I promise, those will be the last food-related metaphors used in this review. The Story: Paul (Coogan) and Claire Lohman (Linney) are meeting Paul's politician brother, Stan (Gere) and his wife Katelyn (Hall) for dinner at one of the most exclusive and swanky restaurants in town. But the decadence of the food can't hide the tension of the reason for the dinner: their sons have done something reprehensible and the world may (or may not) be about to find out. What follows is the most awkward dinner in the history of awkward dinners, as these four (cards on the table... terrible) people decide whether or not to cover up their kids' crime. You're going to need more wine. The Dinner approaches topics ranging from mental illness, cancer, and white privilege, to child abuse, casual racism, the plight of the homeless, and transracial adoption, which is why it starts to all feel overwhelming very quickly. If it had focused on three, or even four, of these very heady topics, it might have been a little easier to connect with any one element, but when the audience is being assaulted with the treasure trove of middle-class malaise presented by these characters, it turns exhausting. And even when The Dinner is engaging, it is, indeed, exhausting. Which is frustrating, because Moverman's film starts out so promising. As the two couples prepare to meet, and we see flashbacks of their sons, there is an undercurrent of restlessness to the entire affair. As a viewer, you can feel that something is deeply wrong with this family, and it's something worse than just whatever horrible thing the boys did (though it is horrible and the reveal will leave you destroyed). The problems arise when the script begins inserting around twenty minutes worth of unnecessary flashbacks, which while adding a significantly depressing familial background, don't do much more than break up the flow of what makes The Dinner an interesting movie to start. Even the appearance of Chloë Sevigny, while always a delight, as Stan's flashback ex-wife, just detracts from the main action without adding anything meaningful to the story. We should have gone to Olive Garden like I said. Because where The Dinner really shines is in the performances, and when the actors are given the opportunity to play off each other as a group. Steve Coogan especially gives a captivating performance as Paul, a man both comforted and tortured by his mental illness. Laura Linney, as well, runs an emotional gamut, and goes from sympathetic mother to cold-blooded monster and back again with surprising ease. The Dinner is at its most riveting when we get to just watch these four performers tell us a complex story in a simple setting; it is when the movie drifts away from those elements that it fails. 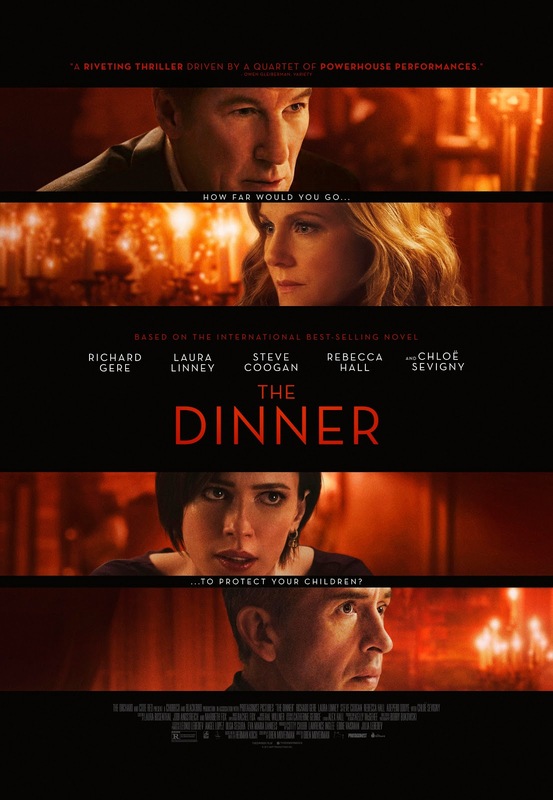 The Dinner is a film worth seeing thanks to its exceptional leads, but it won't have the emotional effect on you that it should. And that's a damn shame.